Roughly 15 years ago John Moyers and Terri Kelly Moyers started vacationing in Hawaii—of course they traveled with paintbrushes. After numerous trips, sometimes twice a year, they finally decided to do something with all the work they had done from the Aloha State. 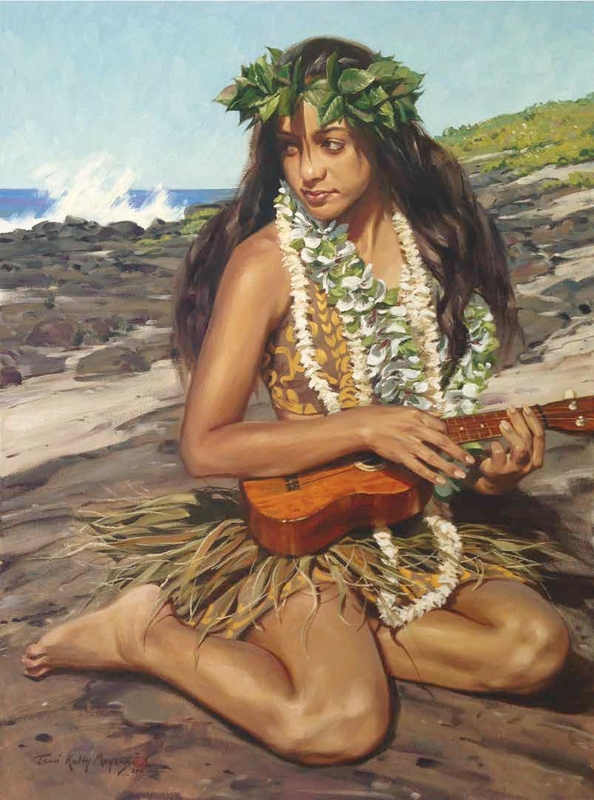 Hawaii – The Paintings of John Moyers and Terri Kelly Moyers, opening March 17 at Mark Sublette Medicine Man Gallery in Tucson, Arizona, will present as many as 60 of the couple’s Hawaiian works, from hula girls on sunny beaches to marine life in crystal clear water to watercolor oceanscapes featuring volcanic rock and churning water. Watercolor, John says, was the preferred method of recording what they saw—“Watercolors are so easy to travel with, especially when you don’t need an easel, they dry fast and you can roll them up for the ride home,” he says. Terri Kelly Moyers, Sounds of Kauai, oil on panel, 40 x 30"
Other works include the oceanscape Primordial Hawaii, featuring a beach covered in volcanic rock and pools of reflective seawater. She points out that these rocks are some of the newest land on the planet, having only oozed from the earth as lava recently—“it’s humbling to think about,” she says. In Lapahoehoe, a watercolor, Terri gets to show off her pronunciation of Hawaiian landmarks; she says the word like “lap-uh-ho-A-ho-A.” Even her pronunciation of the state, with an emphasis on the E sound on the tail of Hawaii, shows how the couple have slowly become adapted to the state’s unique environment and culture. For John, whose usual work is so closely tied to Native Americans in the Southwest, he can see similarities with the cultural beauty of Native Hawaiians, whose customs and traditions make the state a unique place, even amid a nation of unique places. “The people are just incredible,” he says. 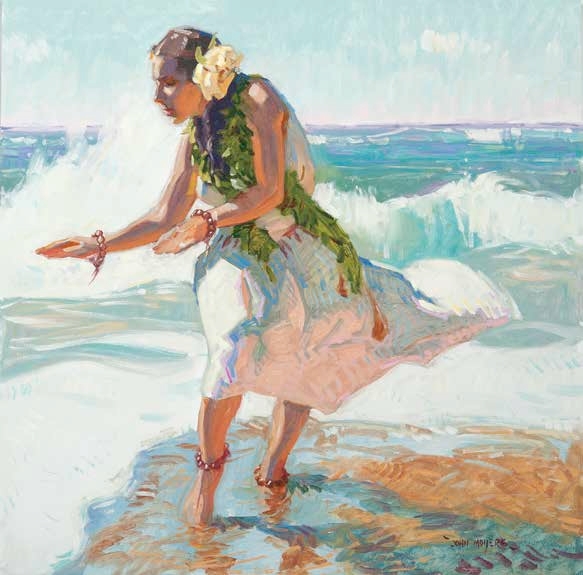 John Moyers, Wade Dance, oil on panel, 24 x 24"
Wade Dance features a hula girl dancing in the sand as the ocean crashes at her feet. A similar theme is explored in Sunset Hula, but with dramatic golden light that comes from behind the dancer as the setting sun creates a striking silhouette. Many of the works were sketched on location in watercolor, and then used to inform larger oil paintings in John’s New Mexico studio. Other works include two paintings of wildlife: Honu, featuring a sea turtle in rippling water, and Three Jacks, an underwater view of a trio of fish against swirling blues and whites. After chatting about her Hawaiian work, Terri closes in a fitting way: “Mahalo,” she says. 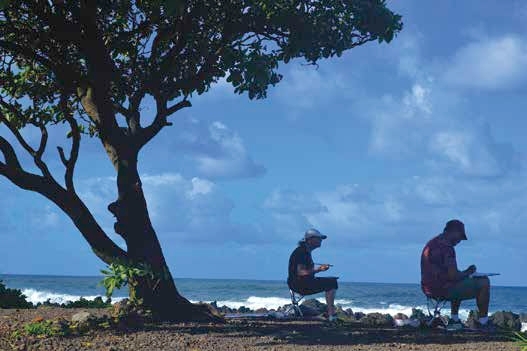 John and Terri Kelly Moyers painting on location in Hawaii.